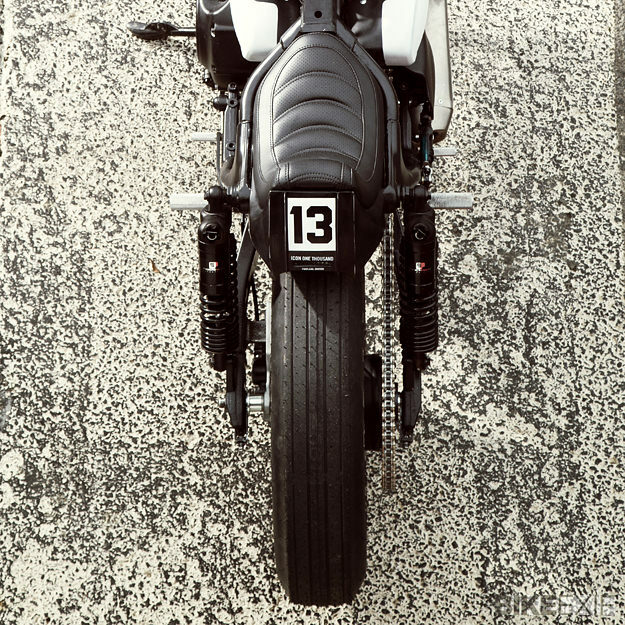 ICON Motosports is back with a killer new custom. 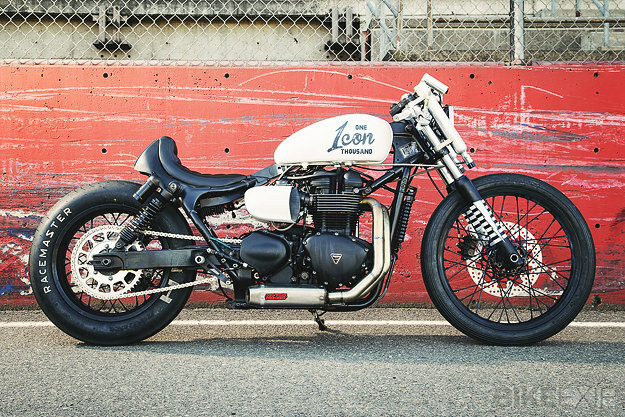 It’s the company’s third hookup with Triumph, who delivered a 2013-model Speedmaster for baptism by Sawzall at Icon’s Portland headquarters. In the 1960s, Triumph 650 twins ruled the drag strips and the ICON 1000 Speedmaster is a nod to this past—with a few discreet updates for modern competition. Like a Holley nitrous oxide system with twin fork-mounted bottles, which supply enough juice to double the horsepower at the push of a button. A custom-fabricated exhaust system built by Vance & Hines gives the Speedmaster an edge over the quarter-mile, and race specialists Latus Motors Triumph have fettled the internals of the 865cc air-cooled twin. 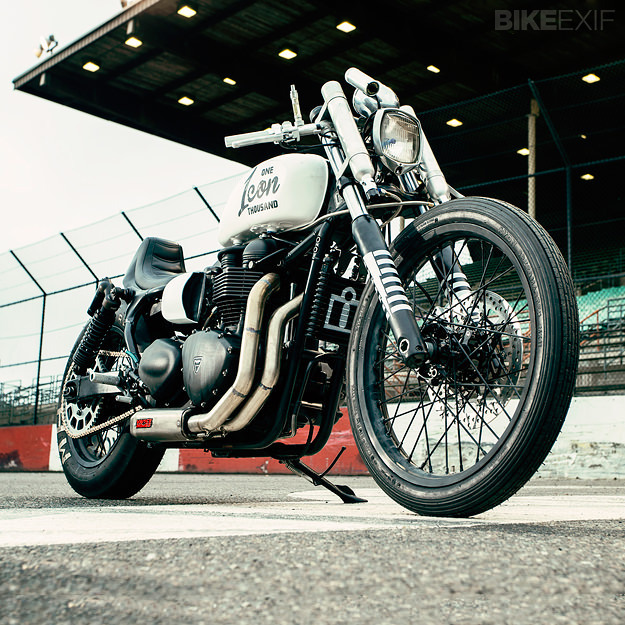 Which, incidentally, sports the same rumbling 270º firing interval as the Triumph Scrambler. Working with design director Kurt Walter, the Icon crew swapped out the stock Speedmaster wheels for lighter rims from a Tiger 800XC. 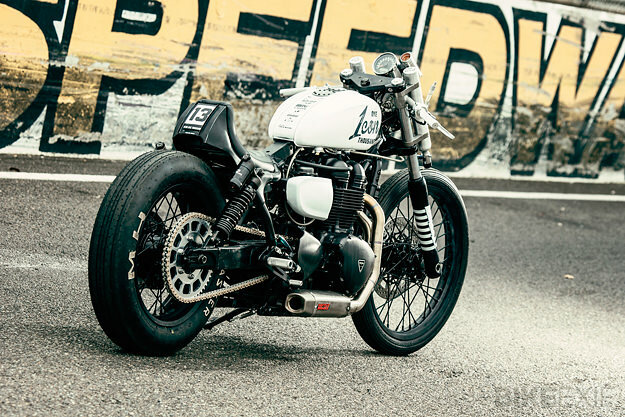 Out back is a period-correct M/H Racemaster drag slick; up front is an (appropriately named) Avon Speedmaster tire. A Kawasaki ZX-10 master cylinder is hooked up to Galfer brakes with EBC pads, to ensure the fun stops when it needs to. The rider hangs on tight using clip-ons from Zombie Performance and rearsets from Loaded Gun. 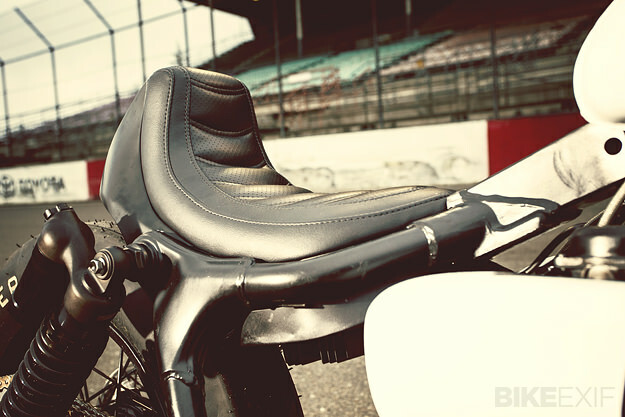 Helping to cushion the sudden power rush are 970-series piggyback shocks from Progressive Suspension, and a custom seat from New Church Moto prevents the rider sliding backwards when the Speedmaster is rushing forward. And, just quietly, the headlight is from a humble Honda Dream. Watch the bike in action in the official video or head over to the ICON 1000 site for images of the company’s previous spectacular builds. 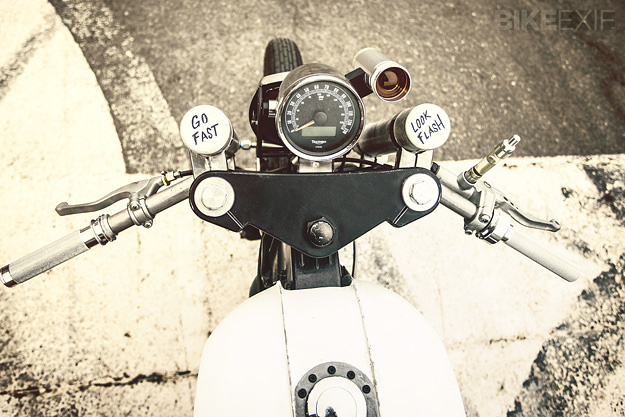 You can see what a stock Speedmaster looks like on the Triumph Motorcycles site.